Heather Kirkpatrick’s documentary, Mary Meets Mohammad, captures two worlds colliding in “Australia’s least multicultural town” of Pontville, where Tasmania’s first refugee detention centre was opened in mid-2011. The community is polarised between racist fear and compassion when approximately 400 refugees are transferred. The film follows Mary, a 71-year-old devout Christian and refugee-hater, who questions her racist assumptions when her knitting club volunteers to make beanies for the asylum seekers. The documentary is a welcome antidote to the common narrative that refugees are locked up because Australians are inherently racist and fearful of outsiders. Instead it reveals that attitudes to asylum seekers are based on myths and lies perpetrated—myths that, for Mary, cannot withstand meeting the refugees face-to-face. The documentary opens to ugly scenes of community opposition at an Immigration Department community briefing on Pontville’s opening. “We don’t know what kind of people we’re going to be introducing into our community, around our children!” says one woman. Mary says she has never met a Muslim man, and expects them to be “a pack of heathens”. She thinks the refugees are getting a better deal than most locals. “They’ll get all the pension money, people who are waiting for houses will be left on the waiting list”. Mary herself lives on the pension in a Housing Commission unit. Curiosity about the supposed lap of luxury for refugees compels her to join the contingent of beanie-deliverers. Despite herself, Mary is transformed. She befriends 26-year-old Afghan Hazara, Mohammad, who lived most of his life as a refugee in Quetta, Pakistan. The Hazara are a persecuted minority. Mohammad’s two elder brothers were shot by the Taliban for running a business. When the knitting group return from their visits to Pontville, they question the lies they have been fed. 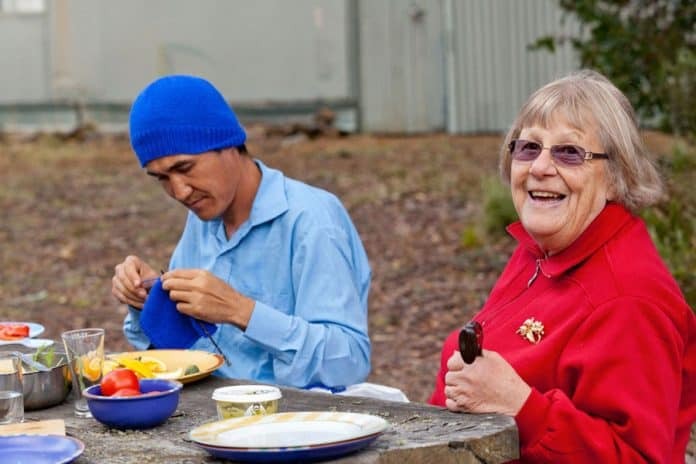 Underlying the moving story of Mohammad and Mary’s unlikely friendship, Kirkpatrick weaves a more profound social commentary through her interviews with Tasmanian locals. These shed light on why many people accept racist ideas, and particularly how racism gets a foothold amongst the poor and working class. Refugees, as well as immigrants, are an easy scapegoat for the very real lack of services, inadequate welfare, and unemployment. One woman’s desperation is apparent when she says, “They [the refugees] have doctors up there…we don’t even have a doctor here”. A member of Mary’s pensioners’ group believes that refugees in the community are on Centrelink benefits twice what pensioners get. This is a myth based on a hoax email. Asylum seekers do not receive any Centrelink benefits, except those on bridging visas who receive 90 per cent of the Newstart Allowance and are prevented from working. The documentary could do more to explain the source of these anti-refugee myths. The role of government, policy makers, and a zealous media are not strongly featured. The narratives are spun out of Canberra, not Pontville. The imprisonment of asylum seekers itself create the impression of criminality and difference. The film shows this by contrasting the current detention regime with earlier models. In 1999, Brighton—a town very close to Pontville—hosted 400 Muslim refugees from Kosovo for six months. They were not detained behind fences, but were allowed to come and go, and mix with the Brighton community. A local priest explains the contrast in how they were received. It is the razor wire and security guards that create the perception of refugees as criminals. Mohammad’s own struggles with depression and isolation thanks to the detention regime also throw sharp light onto the cruel and arbitrary system. Oddly, the documentary ends by calling on viewers to campaign for a 90 day limit on detention. But it powerfully makes the case itself that no detention at all is necessary. This is a documentary that should have got a prime time spot. It is a reminder that racist ideas are based on flimsy myths that can be broken down.